The research focuses on determination of geochemical characteristics and distribution of Rareearth elements (REEs) in Makirina Bay sediments. The overall REEs concentrations in Makirina Bay sediments samplesdetected during study ranged from 123.94 ppm to 188.74 ppm. REEs content showed a gradual increase towardsthe depth of sediments. The average UCC-normalized REEs pattern pointed out negative δCe values and positive δEuvalues, indicating reductive conditions prevailing in Makirina Bay sediments. Calculated enrichment factor values arein the range of natural variability with no addition of different anthropogenic components. According to sequentialextraction procedure results, the studied fractions can be followed from highest to lowest percentage of REEs as: oxidizable> exchangeable > reducible+residual > reducible > water soluble fraction. The calculated transfer factor valuesgenerally confirmed the sequential extraction procedure results. The concentrations of all studied REEs are higherin above-ground than in below-ground biomass of seagrass Cymodocea nodosa. KOMAR, Darja et al. 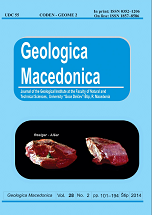 Geochemical characteristics and distribution of rare earth elements in makirina bay sediments (n. Dalmatia, Republic of Croatia). Geologica Macedonica, [S.l. ], v. 28, n. 2, p. pp. 127-137, dec. 2014. ISSN 1857- 8586. Available at: <http://js.ugd.edu.mk/index.php/GEOLMAC/article/view/921>. Date accessed: 20 apr. 2019.